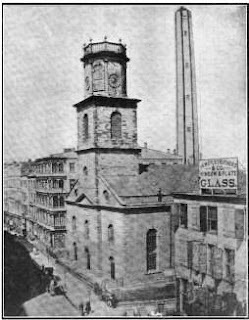 St. George’s Church was founded in 1749, at a time when the vast majority of Manhattan’s residents were Episcopalian. 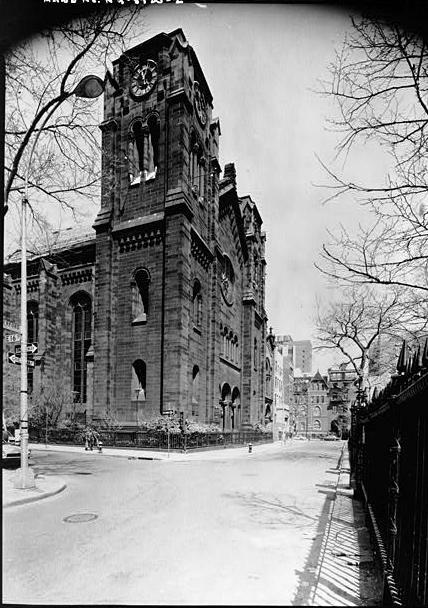 Three years later the congregation’s impressive stone church was completed on the corner of Chapel (later renamed Beekman) and Cliff Streets. The church burned in 1814 and was rebuilt a year later. The wealth of the congregation was reflected in the steeple clock. It was created by master Roxbury, Massachusetts clockmaker Simeon Willard. Although one New Yorker described the location in his diary in 1848 “a howling wilderness;” the northern migration of Manhattan’s wealthy into the area was well under way. Nearby, Samuel B. Ruggles’ Gramercy Square was quickly being ringed with grand mansions. 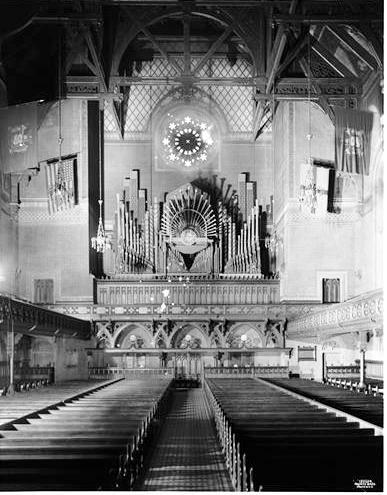 Three years later, in November 1848, the first service was held while construction continued. As the structure neared completion in 1855 The Times made note of the cost of the striking complex. “Another portion of ground was purchased from [Stuyvesant’s] heirs for $10,000 and upon this site, covered by the church, the chapel, and the Rectory, the Vestry have expended and paid about $260,000. The additional cost of the spires, which are now erecting, with the bells and clock, will make the entire amount $325,000.” The outlay would amount to more than $9 million in 2015. 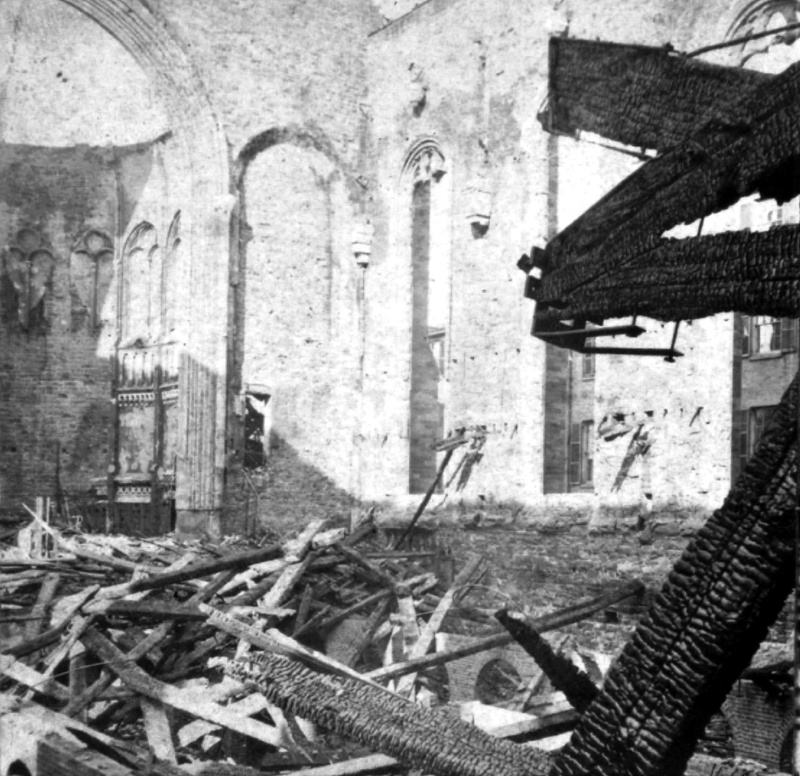 Tragically, just nine years after construction was completed, fire broke out on November 15, 1865. 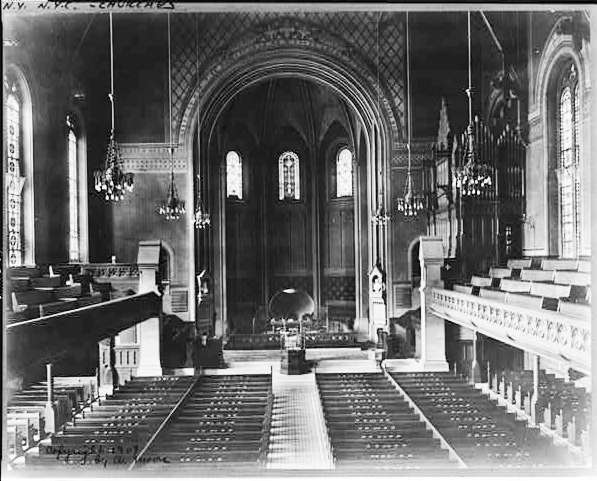 The New York Times reported “Strenuous efforts were immediately made to save the furniture and fixtures of the church, with very little success.” Although two “fine gothic chairs” and the prayer books, hymnals and Bibles were removed, everything else in the interior was lost. The following day only the shell of St. George’s remained. The Times said the four bare walls, the two towers and spires were “as impressive as any of the monastic ruins of the old world.” The wealthy congregation wasted no time in rebuilding and just two years later the church was reopened. At the time the church’s rector was the Rev. Dr. Stephen H. Tyng, considered to be among the most notable preachers of the period. On April 7, 1878 he shocked his parishioners when he announced his retirement at the age of 78 after 33 years with St. George’s Church. The Stuyvesant Square neighborhood was changing by the time Tyng resigned. Waves of German immigrants flooded the area. But unlike many upscale churches faced with the changing demographics, St. George’s parish did not abandon its church. Its congregation continued to include some of the wealthiest and most respected names in the city, including Senior Warden J. P. Morgan. The newspaper listed many of the mourners, including politicians, gamblers, theater owners, fighters and others. Included was “Jake” Somerindyke, “an old and well-known turf gambler;” “Old Bill” Tovee, a veteran sporting man; “Michael Boyle, the oysterman,” pugilist George Rooke; and a host of others who were better known by their nicknames than their given names. Through the influence of J. P. Morgan, the respected Rev. W. S. Rainsford took the pulpit as rector in 1883. He gave his first sermon on January 14 that year, after which The New York Times gave its approval. “He is a young man, about 32 years of age tall, straight as a reed, and of prepossessing features. His manner is frank and earnest, and his sentences were emphasized by frequent gestures.” Born in Dublin, he would hold the position for two decades, espousing sometimes shocking views from his pulpit. Before he made headlines with his sometimes unorthodox social views, he would have to address a disturbing problem within his staff. In May 1885 50-year old W. H. Pudney was made a sexton of the church. It did not take him long to bring scandal to St. George’s. In June a German immigrant, Emil Michel, who lived above his small shoe store nearby at No. 197 Third Avenue, noticed that his 9-year old daughter Eva, was acting strangely. When he questioned the girl, her answers were initially evasive; but she finally admitted to being abused twice in the church by Pudney. A doctor’s examination proved the crime. Eva then revealed that 10-year old Lizzie Speerschneider had also been abused at the same times. Emil Michel rushed to the home of that girl’s father, Edmund, who ran a crockery store. The New York Times said “Both are respectable, hard-working Germans.” A physician’s examination of Lizzie supported the accusation, as well. The millionaire congregants were given a Christian challenge. Rainsford suggested that they allow poor families to live in their mansions during their summer absence. A committee of ladies was put in charge of selecting reliable, needy families who would not only enjoy the luxury of the lavish surroundings, but would act as caretakers. 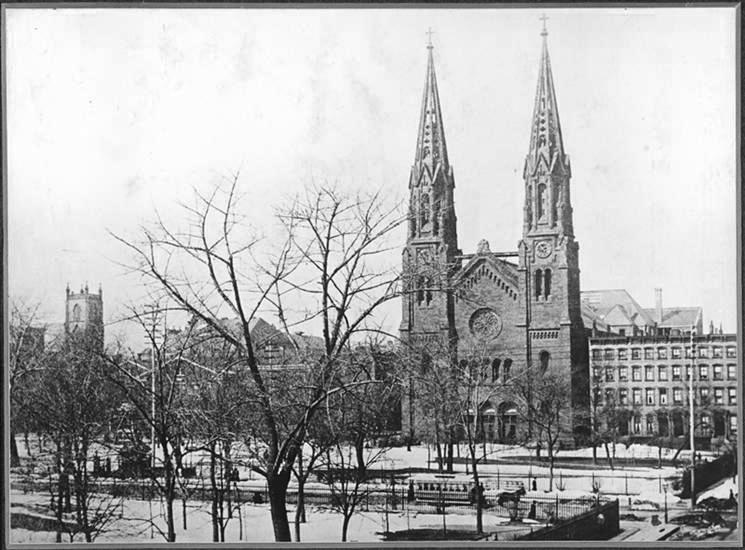 Sadly, the masterful, lacy stone spires were deemed unsafe in 1888 and taken down in 1889; leaving the towers blunted. The first real issue regarding Rainsford’s unusual stance on liquor came about in 1893 when he approved Moore & Tucker’s saloon “right in the immediate neighborhood of his church,” as described by the New-York Tribune on December 11. The newspaper said “Much talk has been caused lately” by the move. Perhaps no funeral in St. George’s Church was more prominent than that of J. Pierpont Morgan on April 14, 1913. Morgan had written out his own funeral instructions, which were followed to the letter and marked by “extreme simplicity,” as reported by The Times. Approximately 1,500 were in the church, while the park outside was packed with onlookers. The floral arrangements included tributes from the German Emperor, the King of Italian and the Governments of France and Italy. The most shocking event to take place in St. George’s Church occurred on Sunday morning, April 18, 1920. After Dr. Karl Reiland’s sermon, the vestrymen moved down the tile-floored aisles with the silver collection plates. Among them were Herbert Satterlee, the son-in-law of J. P. Morgan, and Dr. James Wright Markoe, Morgan’s former physician. At first few realized what had happened. The choir continued to sing and the organ to play. “The collection salver fall from his hand with a crash, and gold and silver coins rolled in all directions.” As the murderer headed for the door, several congregants rose to their feet. In the meantime, Dr. Reiland rushed to Dr. Markoe. Satterlee blocked the man’s escape route, holding the collection plate in front of his chest as a sort of armor. The man fired a bullet directly at him, which grazed Satterlee’s beard and embedded itself into the paneling. He fired two more times, causing the men in the foyer to drop to the floor. The assassin made in nearly through Stuyvesant Square before the congregants overpowered and disarmed him. Thomas W. Simpkin was arrested and charged with three counts—murder in the first degree for the killing of Dr. Markoe, and assault in the first and second degrees for wounding Dr. George E. Brewer who wrestled the gun from Simpkin. The Stuyvesant Square neighborhood continued to see change throughout the 20th century. But the staid brownstone church remains unchanged. It was among the first of the new Landmarks Preservations Commissions designations, in 1967. The façade received a well-deserved restoration in 1980, and the Simeon Willard clock continues to keep time as it has for two centuries. I've been both intrigued and shocked to discover, while working on my wife's family tree yesterday evening, that Dr. Markoe's crazed assassin ,Thomas W. Simpkin, is her 2nd great uncle!